The heart of the lattice is the note called 1. This note is the tonic. Almost all the music you hear — pop, rock, classical — has one note that is at the center, a master note against which all other notes are measured. That note is the tonic. It’s the Do of Do Re Mi. When you call a scale “G Major,” or say that a song is in the key of G, the G is the tonic. A single note means little by itself. But when it’s considered in relation to the tonic, it acquires meaning. The examples in yesterday’s post show how a note changes character when played against different tonics. The tonic establishes the framework for the rest of the notes in a piece. It’s the anvil on which the music is forged. The tonic can be any note. When you tune your guitar by the campfire, without a tuner, just tuning it to itself, you’ve chosen a reference frame that will make perfect sense, regardless of whether it’s the same frame as a piano or orchestra back home. You can happily play great music in the key of G-and-a-half, if you’re playing solo. Once you’ve established the tonic, the rest of the notes are tuned, and named, relative to that note. The tonic is the center, the Big Bang of that particular musical universe. 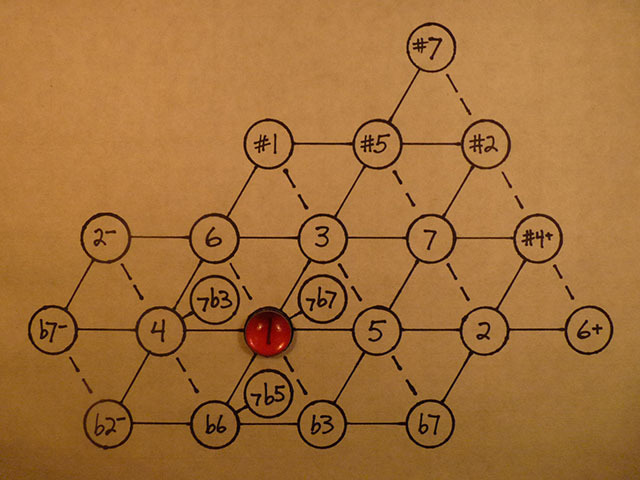 The rest of the structure comes from the interplay between the tonic and small, whole numbers — mainly 2, 3, 5 and 7. The tonic is Home. The lattice shows how music is a journey, away from home and back again, through different lands, each with its own scenery and feeling.